Forever 21 Top (Small) & Jeans (27" waist) Small Lot! This Surprise Box is for a young Lady, or teen Clothing lot. I’ve set up several boxes of different clothing and accessories inside for any occasion! GORGEOUS, ELEGANT, CASUAL, ATHLETIC. Each box contains from 6-9 pieces ! Mixed Lot Of Zara Forever 21 Asos sizes XS/S. All pre-owned. Condition ranges, generally great! Some never worn. • 10 Dresses. Great for Resale or Fill your Closet! Only U.S. Credit Card Accepted. Jennifer Moore (Jenni). ICY Fashion (Blue stretch pants) - note: when not being worn they do bunch up a litle Along seems, however not noticeable when you wear. (if you do not want these let us know). One dress is XS. h&m dress is size 2. Burgundy shorts are size 24. (Any age range can wear these clothes! I hope they are able to put a smile on your face as they did to mine :). -19pc Mixed Lot! Lot Of 9 Womens Clothing Size M Great Brands Forever 21, H&M,Jessica Simpson etc. Condition is Pre-owned. Shipped with USPS Priority Mail. 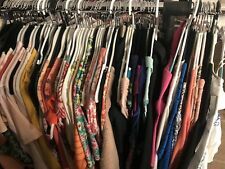 Juniors Clothing Lot Size XS/S Huge Lot Of Ladies Clothing. Condition is Pre-owned but in great condition. One item is new with tags. Great brands Forever 21, H & M, Nike, Lularoe, LA Idol and more. Shipped with USPS Priority Mail. Forever 21 Bust: 32 in. /Shoulder to Shoulder: 26 in. / Top Length: 28 in. / Jay My Bust: 26 in. / Dress Length: 28 in. / Race Back: 22 in. / Excellent Used Condition! Lot Of 2 Tops Size Small Forever 21 And Aeropostale. Condition is Pre-owned. Shipped with USPS Priority Mail. NO MAJOR ISSUES, NO HOLES OR BIG STAINS JUST SLIGHT WEAR FROM USE AND LAUNDERING AND THEY DO SEEM TO PICK UP A LOT OF LINT, HAIR,ETC. Huge Lot of Clothing! Only U.S. Credit Card Accepted. Most items like new, black polkadot blouse has small tears in the elbows Lauren Conrad, Vineyard Vines, Forever 21 and Jennifer Lopez Lot Women’s Trendy Stylish Clothes For Young Professional And Going Out (s/m/l). Condition is Pre-owned. Shipped with USPS Priority Mail. Dark Blue Denim Jeans 27" waist. Black Denim Jeans 27" waist. Blush Color top slightly sheer size small. Lightly used Forever 21 Shirts, sweaters, And long sleeves. All size small and super cute for every season. Mixed lot Zara Forever 21 H&M Xs/S. All in good condition. Shoes are zara size 38. Lot Of 3 Shirts Size Small Forever 21 Harvard And Old Navy. Condition is Pre-owned. Shipped with USPS Priority Mail. Black long sleeve romper size XS (Charlotte Russe)- missing lace up. White ruffle halter top size S (Victoria Secret). White lace crop top size XS (Urban Outfitter's Thistlepearl). Blue sheer top with black lace in back Size M (No Strings Attached). 2 pairs of shorts size 3 by RSQ jeans style is Cabo Cutoff. Lot Of Women's Juniors Tops Small Extra Small Gap Forever 21 Converse Old Navy Tops gently worn and all are in great condition! Previously owned mixed lot of medium blouses and tops 18 pieces, a variety of styles and colors. The Forever 21 blouse has a couple of snags as pictured the gray blouse needs mending as pictured but overall everything is in good condition if you can mend those great if not give away but still plenty of wear left in all items. Condition is Pre-owned. Pink and blue plaid is a size small. The style is a short, fitted ribbed t shirt with crew neck, and long sleeves. The fabric is a small ribbed soft knit in 4 colors. They are in excellent new condition and machine hand washable (40/30/21 Rayon/Acrylic/Polyester). Forever 21 Bundle- All pre owned in excellent condition. 2- Mid Length black maxi skirt with stretch- Size Large- 28" length. Forever 21 - Rompers. Perfect for summer!! New with tags. Black and white romper is size medium and originally $24.90. Blue and white romper is size small and purchased for $27.90. Excellent deal!!!!! There is a black Forever 21 Large. Length is 19", bust is 42" and sleeve is 2". Rayon and Spandex. The other one is a Cable & Gauge also Large the length is 21" bust is 40" and sleeve is 2". 97% Viscose 3% Spandex. Mixed Work Attire Lot XS/S. In very good condition. Mixed brands of Forever 21 and H&M. Forever 21 and Glyder. GLYDER - Gray with light blue trim - Capri Leggings - pocket in waistband - legs have ruched sides towards the bottoms of them - XS. FOREVER 21 - Dark gray/black with pink waist band - full length leggings - pocket in waist band and pockets on the sides - Small. Bust 18", Length 27", Sleeve Length 21". 100% Polyester. Japna indigo blue, pink, gold, white off-shoulder boho 3/4 sleeve tunic. Sleeves are free-flowing. Bust 21", Length 22", Sleeve Length 18", Sleeve Width at Bottom 8.5". Military style jacket. Military green. FOREVER 21 WANDERLUST SHIRT. LOT OF 2 SCREEN PRINT SHIRTS. SIZE LARGE. Liz Claiborne Size Small Green cable knit cotton crew neck sweater. Forever 22 cotton blend, size small, red/white mix crew neck sweater. H &M DIVIDE white laced bottom trim detail long sleeve white top, size small, poly blend.